Home » Wrestling News » WZ Daily Podcast: Will WrestleMania Ever Go To The UK? 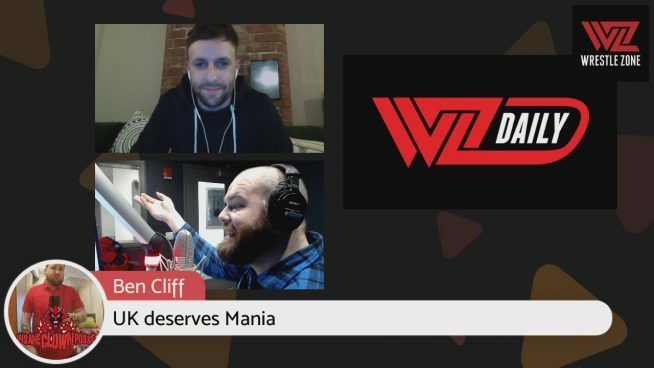 On the latest episode of WZ Daily, it was a trans-Atlantic clash of wrestling punditry with 101WKQX’s Kevin Kellam being joined by WrestleZone Roundup‘s Iain Chambers took on all the big hype leading into WrestleMania. Plus since we had a UK perspective, could WWE bring the show of shows to England? They also discuss the developing story of Goldust and his possible WWE exit. Note this episode was recorded prior to Dustin Runnels clearing the air on his current contract status, but it’s interesting to see where he could end up. Chambers and Kellam also dig into the media landscape that All Elite Wrestling. Other topics covered include which big babyface hero for WWE going into MetLife Stadium could lose big: Becky Lynch, Seth Rollins or Kofi Kingston? All these questions and more, get answered! Also check out the latest episode of the our retrospective podcast, Get the Tray Tables!